Only 13 left in stock - Order today! The Riedel Vinum Port glass shows off the rich fruit and sweetness that characterize port. The bowl's small, slender shape and narrow rim deliver the optimal balance of rich fruit bouquet and complex aromas, while understating the high alcohol content. This allows you to appreciate the harmonious blend of flavors and enjoy the delightful finish. I just broke a favored dessert wine glass (he said it was hand blown). Are any of these dessert glasses "hand blown"? The Riedel Vinum Port Glasses (Set of 2) are machine made. The Riedel Sommeliers Sauternes/Dessert Wine Glass (1), item number 712 11 01 are mouth-blown as are the Riedel Sommeliers Value Set Chablis/Chardonnay, item number 712 03 02. The Riedel Sommelier series are hand blown glasses. They are very nice glasses with a reasonably heavy price, and they can break very easily especially when washing them. What are the dimensions for these? Is this glass also suitable for serving madeira and sherry? I tend to drink Amontillado and Finos mainly. 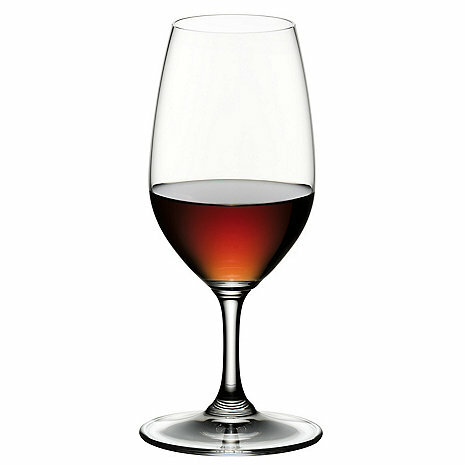 BEST ANSWER: Thank you for your question, the Riedel Port along with the Fusion Port glasses are ideal for both Madeira & Sherry. Are these glasses useful for Madeira as well? BEST ANSWER: Thank you for your inquiry. Yes, the Riedel Vinum Port Glasses would be appropriate for Madeira as well as it is a fortified wine. If you have any further questions, feel free to contact a Storage Consultant at 800 377 3330. Thank you again. These are great if you just want to enjoy some port on a Tuesday night, or also if you're entertaining on the weekend. Reidel are the only wine glasses I will buy. No other glass can showcase a specific wine like a Reidel! I purchased these glasses for my husband. He is very happy with them. These port glasses are beautiful and were an excellent gift for a port-lover. I would recommend them to anyone. They have a very delicate look and feel making any time you use them into a special occasion. The delivery came days before we expected it! Reidel Vinum Port Glasses AWESOME! These port glasses are good for entertaining & fine dining, as well as for use on some random Tuesday night when you decide you'd like to enjoy some port. Life's short, buy these port glasses! Very nice port glass, price to quality point excellent. I got a set of these somewhere else for my daughter for Christmas. So, naturally, I had to have a set for myself. They're a bit tipsy, but when you get a the hang of it, they're great. Just the right size for a wee taste.